Karaoke Studio is the most sensible item on this list, released by Bandai in 1987. 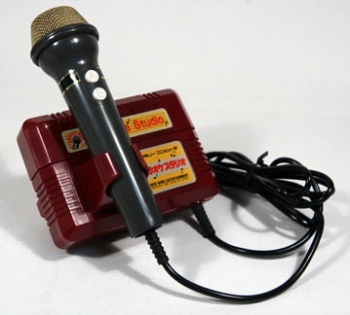 It was a combination of game and peripheral, a cartridge that plugged into the Famicom like any other with a cable attached to it connecting it to a microphone. The Karaoke Studio cartridge also had its own mini-cartridge slot that accepted smaller expansion cartridges with more songs. Once activated, players could enjoy the traditional Japanese art of singing badly with friends in the comfort of their own homes. It included 25 songs, which played in primitive 8-bit format while the lyrics appeared on the screen, accompanied by imagery related to the song. Players sang into the microphone, which allowed Kaoraoke Studio to pick up your voice and evaluate your performance. Or try to, at least. The quality of the music is obviously primitive, but - as anyone who's ever attended a karaoke night can attest - musical quality isn't exactly what karaoke is about. The video sequences accompanying the songs are actually pretty neat. They're surprisingly detailed and genuinely charming, depicting things like a little sprite-based Santa riding his sleigh and going down a chimney for "Jingle Bells" or... well, other stuff that is presumably appropriate to the Japanese pop songs they accompany. There's also a rather dramatic-sounding tune accompanied by a depiction of five guys transforming into Super Sentai-style superheroes and then merging into a giant robot, which is awesome. Karaoke Studio illustrates a subtle way the Famicom was more accessory-friendly than the Nintendo Entertainment system released in the rest of the world: Its cartridges went into a slot on on the top of the system, like the Super Nintendo or Sega Genesis, rather than an internal closed compartment like the NES. Since this design left the area around the cartridge slot open, it could easily accommodate cartridges of nonstandard shapes or other, larger devices. The NES could not, as anyone who has ever experienced the epic struggle required to cram the original Game Genie into its unwilling maw can attest.